Sorry for the delayed posting of Thailand Tuesdays these last two weeks! Grown-Up Life Stuff, it turns out, doesn’t care whether you have a blog post due, so Thailand posts should go up Tuesday and Thursday of next week. Also, I should take this opportunity to warn you: if the implications of the phrase, “that’s definitely not pomegranate juice” alarms you, you might want to skip this post. Check out last week’s Adventures in Ayutthaya instead, or my attempt to break down the complicated rules of Mongolian card games. As you may recall, I wrote very little in my journal on the train to Phitsanulok. Partially, this is because I was in no hurry to start writing once aboard, but mostly it’s because of my fateful decision to snack after only a paragraph of writing. A pomegranate is a messy fruit under the best conditions, and difficult to eat under all of them. If there is no table on which to put it, I would not recommend holding one in your hand while you slice it open. I especially would not recommend doing this with a new knife you acquired at the black market earlier in the week (though, of course, most people don’t need to worry about their knives being confiscated during an accidental venture onto Mongolian presidential property). I had gotten stitches on a different finger of the same hand barely three months earlier after an incident with a rotten carrot and a freshly sharpened (and previously very dull) knife; the most stressful part of that process had been debating whether I need to go to the hospital for stitches or not, since I didn’t want to brave Mongolia’s largely undeveloped health care system unless I absolutely needed to. This time, there was no cause for debate. The cut was deepest at the base of my left ring finger, right in the crease of the joint, and continued in a small crescent shape onto the lower-most segment of my pinky. There isn’t much flesh at the hinge of a joint, even on the inside, and I had clearly cut through all of it; whether it was tendon or bone, I don’t know, but seeing white at the bottom of the wound didn’t seem like a good sign. Had this happened in Mongolia, I would have been completely SOL. Mongolian trains are impressively slow, and towns with hospitals are few and far between, so it would likely have been hours before I was able to reach one. Once there, the language barrier would have rendered me unable to communicate much beyond, “I’m hurt, please fix this” – both because my Mongolian is limited and because most Mongolians outside the capital speak so little English. Just asking the train conductor where the nearest hospital was and how to get there would have been an undertaking. Thailand was an entirely different experience. My conductor spoke accented but entirely understandable English, though he wouldn’t believe I needed to go to the hospital until I showed him the wound. Reluctantly, I unclenched my fingers and removed the wad of napkins to show him, provoking a shudder and a grimace. It didn’t seem to bleed at all so long as I kept the area constricted, but as soon as I opened my hand, the flow was renewed, and I replaced the napkins quickly. “Paper?” he said, and then, “no, bad,” tearing open a plastic-wrapped pillowcase for me to use instead. The next town the train was to stop at didn’t have a hospital, he said; it would be an hour before we reached the next one that did, but he’d make sure I got off the train there. He walked me back to my bunk and asked for my ticket and passport: he had an accident report to file and Lopburi to call, to make sure medical assistance would be waiting when I got there. I lay back on my bunk, keeping my hand elevated, and waited. Having done it twice now, I’ve observed that it’s remarkable how little a cut from a very sharp knife actually hurts; the primary sensation I felt at the time of both injuries was surprise rather than pain. The conductor, when he returned, seemed unnerved by how calm I was. If I really needed to go to the hospital, shouldn’t I be crying? But I didn’t that evening, not even while they stitched me up. Mostly what I felt was embarrassment. Never having needed stitches once in my childhood of tree climbing and fort building, or even in my adolescence of camping and set construction, I was humiliated at having injured myself. Two rounds of stitches in three months, both from stupid knife handling, after twenty-four years without? I must have gotten awfully stupid this summer. But the other thing I felt, funnily enough, was lucky. Lucky that of all the places where I could have cut my hand open, I picked a train car overseen by a conductor who spoke enough English for us to communicate. Lucky that said conductor did everything in his power to help me: calling ahead to the station at Lopburi, carrying my backpack off the train for me so I wouldn’t have to try to manage it one-handed, even writing a note on the back that allowed me to redeem it in Lopburi for the remaining portion of my journey to Phitsanulok, as long as I undertook it at the same time. Lucky, also, to have done this in a country known for medical tourism. With my experiences in Mongolia fresh in my mind, I was very impressed with what I saw of Thailand’s medical system. The one doctor in the emergency room who spoke good English was called over repeatedly as the staff asked important questions like what I had cut myself on, whether I was allergic to iodine or penicillin, and whether my tetanus shots were up to date. The doctor who stitched me up said only three words to me – “I will suture” – but she was quick and thorough, and I didn’t have to worry about sliding off plastic stool as she worked. I left the hospital that night with seven stitches, a Thai medical ID card, one packet of main meds, and one of penicillin. The entire visit, including the medication, cost me about 20 USD – less money than I would have spent on drinking in the week of antiobiotics when I now couldn’t. And less than it would cost me, even with insurance, to get a cortisone shot shot a year later in order to resolve the case of trigger finger that would result from the damage to my tendon. And now I had a day to spend in Lopburi, a town I otherwise would have skipped. Categories: Travel | Tags: medical, misadventures, Thailand, travel | Permalink. Linguist. 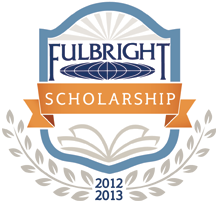 Fulbright English Teaching Assistant. Expat in Mongolia. Writer. Scout, dancer, gymnast, equestrienne.